Did you know that you can help raise money to fight cancer simply by watching cat videos? A new nonprofit called Cats vs. Cancer has made this mission a reality. Cats vs. Cancer launched in December and is quickly gaining a lot of traction. With more than 4,000 followers on Facebook and more than 13,000 Instragram followers, the little company with a big mission is already capturing hearts. A recent study found that watching cat videos can improve your health. This non-profit, run entirely by volunteers, takes the whole concept a step further by using cats to actually battle cancer. “We do this by curating fun and entertaining cat content from across the web and take the money raised by advertising sold on the site (as well as direct donations) and donate it to cancer charities,” said Rachel Gitlin, the Director of Social Media and PR for Cats vs. Cancer. She said that the co-founder, Tom O’Connor, thought of the idea a few years ago when he wanted to combine two things the Internet loves: cats and raising money for a worthy cause. “Since cats rule the internet and almost everyone has been affected by cancer in one way or another, he thought this was a natural fit and Cats vs Cancer was born,” she said. Each month, the site features a cancer charity that will receive any funds it raises. July’s featured charity is The B-Strong Foundation, which helps the families of children diagnosed with cancer by paying for rent, utilities, or other expenses. Helping Cats vs. Cancer is easy. All you have to do is visit the website at catsvscancer.org, view the content, and spread the word. 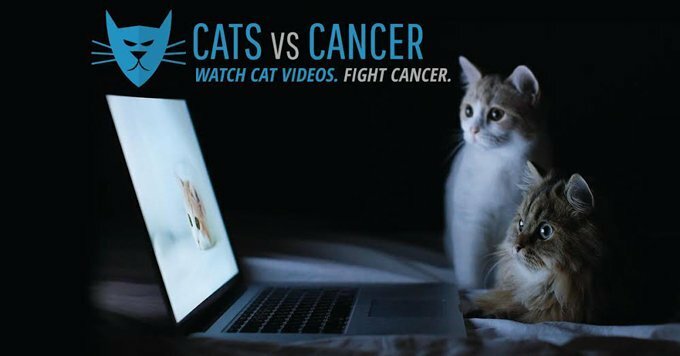 Cats vs. Cancer features cat videos, gifs, and memes. They not only raise funds through ad revenue, but also with direct donations and through a partnership with Amazon Smile’s affiliate program for charities. Cats vs. Cancer also teams up with famous “Internet cats” to raise money for cancer charities. Right now, the organization is running a promotion with Oskar the Blind Cat and his friend Klaus the cat. The cats “penned” an illustrated children’s book called “Oskar and Klaus: The Search for Bigfoot.” For every book sold in July, $5 will be donated to Cats vs. Cancer. More details are available on the Oskar and Klaus website and on Cats vs. Cancer. If you want to keep up with Cats vs. Cancer, you can follow the organization on Facebook, Twitter, or Instagram.